Merrill Louise Hampton, known to many as "Sis" was born on November 10, 1929 in North Vernon, Indiana to late William B and Mildred Goode Litzy. On November 10, 1951, she was united in marriage to the late William Mack Hampton of Hamilton Ohio. They were married for 49 blissful years. A consummate mother and homemaker, Merrill was an excellent cook and enjoyed preparing meals for her family and friends. She would do any and everything for her family. After eighty-eight years of life, Merrill passed away on Wednesday, June 27, 2018. Besides her parents and husband, Merrill is preceded in death by her daughter, Kelly Hampton; son Kevin Hampton; siblings, Joseph Litzy, William Litzy, John Litzy, Martha Cox (James), James Litzy, Lee Roy Litzy, David (Juanita) Litzy and Steven Litzy. 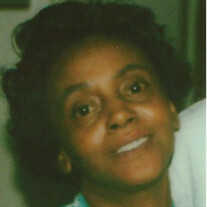 She is survived by three daughters, Norma (Jesse) Fox of Hamilton, Ohio, Ellen Stoney of Silver Spring, Maryland and Phyllis (Alex) Sizemore of New Miami, Ohio; three sons, Dennis M. (LaWanda) Hampton of Hamilton, Ohio, Mark Hampton of Seven Mile, Ohio and Paul (Daphne) Hampton of Mason, Ohio. Nine grandchildren, Christalynn Fox, Steven (Tammie) Fox, Dennis R. (Marisa) Hampton, Andre Hampton, Michael (Michele) Hampton, Edward Chapman, John Rich, Joshua Hampton and Tuesday Richardson; 20 great-grandchildren and 1 great-great-grandchild; a host of cousins, nieces, nephews and friends.